Travelling to Europe was amazing and I leant so much while over there. From the history of Europe to how things are run, I even got to meet a few nice people. One thing that I bring back with me is that everyone in history must have been really short because I didn’t fit in any doorways! The first leg of our trip was in England and it was not what I was expecting having grown up watching Dr Who and British comedies. The history of the country was amazing; every building and cobblestone road was at least 100 years old. We traveled out to a country town called Warwick where we stayed a night in a castle tower and learnt about what life was like back when the castle was lived in. Playing around with old armor was really cool! From there we went back to London. We visited London Bridge, London Tower, Buckingham Palace, Big Ben, Sherlock Homes museum and the Natural History museum, we even visited platform 9 ¾. The culture was not too different from Melbourne, but the train service was 100 times better. After England we took a train ride to Paris via the bullet train service. Paris was a real culture shock. Everyone and everything was in French but I picked up a few phrases, which got me though. We first visited Monet’s Garden and got lots of photos. The scenery there was breathtaking, the amount of care put into this garden to make the colours pop was incredible, you could just stare at it for hours. Next was DisneyLand Paris – that place was massive. The rides were great but the queues were killers, we walked around the park a few times and saw everything we could (even a little sneak peak at the new Star Wars movie). The next day we visited the Louvre and the Mona Lisa, which I have to admit, is a lot smaller than I was expecting. On our last full day in Paris we went to the Eiffel Tower, we climbed the stairs, had morning tea and took in all the sites. It was a nice way to finish off our Paris leg of the trip. Our last leg was Rome. Joining a tour group for a nighttime drive around the city was beautiful. Being there, surrounded by the lights of the city is something you can’t experience in only looking at photos. The next day was Easter Sunday, so we went to Vatican City to see the Popes’ morning service. It was a unique experience and one I would recommend. We then went to see the Coliseum and learnt about the upkeep of their artifacts and buildings. The costs are not paid by the government but are sponsored by businesses, which I thought was interesting but also explained why some buildings weren’t repaired, as no one is paying for it. After Rome we went to Pisa and Florence, we saw the Leaning Tower and many tourists attempting to take photos as though they were holding it up, it looked like they were trying out to be Power Rangers. In Florence we went to the leather and gold town. We learnt about how to tell real leather from fake and saw some cool implementations for gold, even elastic gold. After we were sufficiently bankrupt from buying all the leather and gold we traveled to Venice. 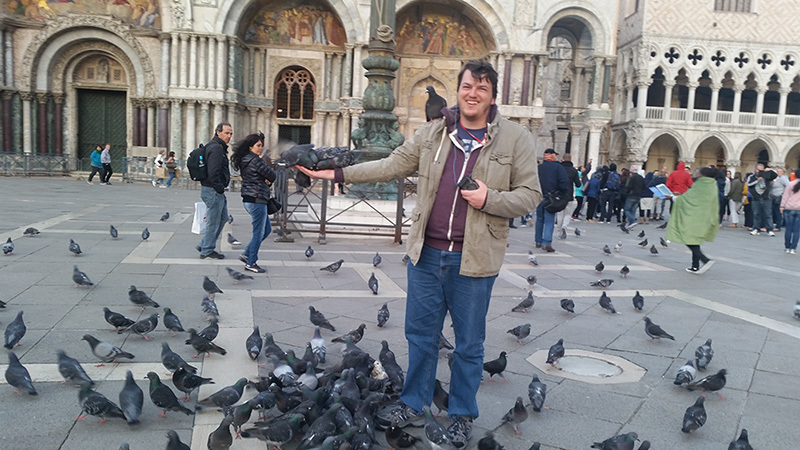 We got to ride in Gondolas, watch a glass blowing demonstration and feed pigeons at St Peter’s square. We finished off the trip in the fishing town of Burano where every house was a different colour, one colour to represent each family so that property ownership could easily be identified. This was an amazing way to finish the holiday and we sat for hours taking in the town. This trip was so much more than I was expecting. Being able to see the history, which is something we just don’t get in Melbourne, was unbelievable. My favorite place was definitely Paris, the people were so nice and welcoming, they really made me feel at home. If you’re planning a trip to England I would definitely recommend going on a castle tour, it’s something I will never forget. However, I have to warn you, always carry coins to use the bathrooms and if you are over 6ft tall, pack a helmet because you are not going to fit in doorways.